KINGHOST Review 2019: Is KINGHOST a Good Hosting? With their extensive range of hosting packages and value-added services, KingHost can help with pretty much everything you need to set up and run an effective website. They’re one of Brazil’s top web hosting providers, having hosted over 300,000 websites and gained significant market share since their launch in 2006. Going for a higher-tier plan affords you more websites on your account, double the memory for every level up, more storage space, and a greater number of value-added features like Varnish Cache and AntiSpam Free email protection. One of the unique perks of KingHost is that they reward you for being a good customer. Whenever you pay your shared hosting monthly bill on time, you accrue weekly data and email storage bonuses – which can easily add up to an extra 1.27 GB per year. This policy also applies to their reseller hosting plans, although the bonuses credited are given in percentage increases rather than a fixed amount. KingHost scored an average uptime of 99.91%, which is not spectacular but definitely above average for a web host. Server performance was excellent when I pinged them from a Brazilian location, but this may drop off from other locations given that their data centers are located solely in Brazil. KingHost employs their own control panel for users to manage their accounts. This was easy on the eyes, well-organized, and fairly comprehensive; I could do everything from checking my resource usage to setting up SSL certification and accessing databases. KingHost’s listed rates are similar and reasonable compared to those of their competitors. 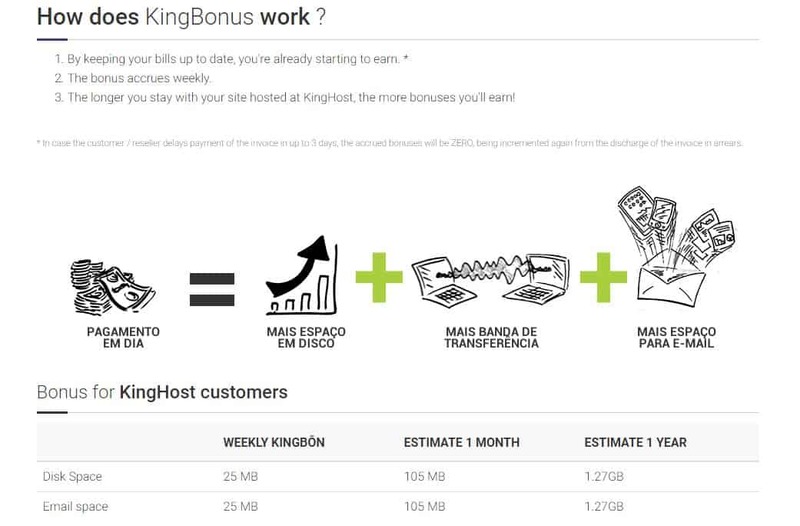 Overall, I did find KingHost more generous than most of the competition in the features and resources they give their customers, especially considering their KingBonus reward scheme. However, I should point out that KingHost’s initial pricing is discounted for new customers; the fees for subsequent renewals will increase significantly after the first year, and are likely to shock those who don’t bother to read the fine print. Honestly, I wasn’t a fan of how they did this, especially given that prices more than double after the first year. If you factor in this increase in price, KingHost’s plans are no longer that affordable compared to the competition. KingHost offers 24/7 support via live chat, email, and a Brazilian telephone hotline. Live chat was responsive enough, though it did take a few minutes to get connected to an agent. Foreign customers should note that their telephone hotline isn’t a toll-free number, so calling from outside Brazil may incur international phone charges. KingHost is a strong choice for Brazilian websites catering to a local audience. However, users should be aware of their price hikes after the first year. Wondering how KINGHOST stacks up against other Web Hosting companies? Enter any other Web Hosting company and we will give you a side-by-side comparison.